With more power, extra torque and a stiffer chassis the Renault Megane R.S. Trophy is hoping to recreate the magic of its predecessors. Harder, faster and even more hotly anticipated than the Renault Megane RS, the Trophy version is packed with upgrades that could make it the ultimate hot hatch. 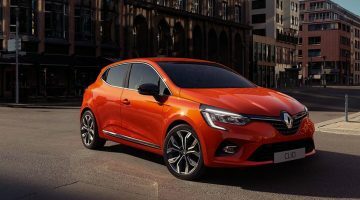 Following the familiar Trophy formula, Renault Sport has liberated more performance from the engine and extensively revised the Cup-derived chassis. By installing a higher-specification turbocharger and a new exhaust system, Renault Sport has extracted more power and torque from the 1.8-litre four-cylinder engine, boosting the respective outputs to 296bhp and 295lb ft or 310lb ft – with the former torque figure relating to the six-speed manual and the latter to the six-speed EDC twin-clutch unit. New ceramic elements in the turbocharger reduce friction, allowing it to spool quicker, ‘aiding acceleration and responsiveness’, according to Renault Sport. To help realise the overall gains of 20bhp and 7lb ft/ 22lb ft over the standard Megane RS, there’s also an active exhaust system. It influences both the Trophy’s soundtrack and performance by means of a valve, which is controlled by the driver modes (selected via the RS button on the centre console). In sportier driver modes, the valve opens, providing a shorter and faster path for exhaust gasses to be expelled, allowing the engine to breathe more freely. In more sedate driver modes the flap closes, routing the gasses along an elongated track, which helps filter out resonance and reduce noise levels. 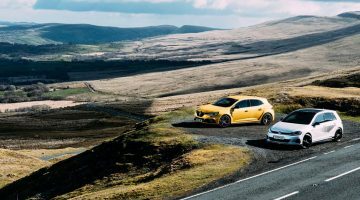 To deliver more agile handling over the Megane RS in Cup guise, spring and damper rates have been increased by 30 per cent and 25 per cent respectively, while the anti-roll bars have been stiffened by 10 per cent. The Cup’s Torsen limited-slip differential has been tweaked to provide greater traction on corner exit and more stability on entry. Unique in its class, the Megane RS Trophy retains the four-wheel-steering system, which is carried over unchanged from the standard RS. As standard the Trophy receives the Cup chassis’, Brembo caliper-clamped, cast iron and aluminium composite front brake discs, which measure 355mm in diameter and save 3.6kg in unsprung masses. The Trophy rides on the same 19-inch wheels as the Cup, although they’re finished with red accents to mark it out from lesser derivatives. However, Renault has confirmed an optional, higher-specification wheel-and-tyre combo is in the pipeline. Each of these wheels – 2kg lighter than the standard-fit items – will be shod with Trophy-specific, Bridgestone Potenza S007 tyres. Another option, immediately available, comes in shape of Alcantara-trimmed Recaro seats – fitted in the previous Megane Trophy. Renault, however, has re-engineered them with greater scope for adjustment, to help drivers better fine-tune their driving position. You can drop seat 20mm lower than before, and there’s continuous-adjustment of the seat’s recline angle, too. Visual Trophy-identifiers are few and discreet: there’s the aforementioned wheels as well as Trophy stripes, which are emblazoned onto the F1-style blade that’s set into the lower front grille. Pricing for the forthcoming Renault Sport Megane Trophy has yet to be revealed. Previous ArticleVolkswagen Golf review – the ultimate family hatchback?